Leaked documents have revealed evidence of a plot to destabilize Venezuela and undermine the rule of leftist President Nicolas Maduro. The papers appear to substantiate Caracas’ claims of outside attempts to cripple the country through internal sabotage. The plans are allegedly the product of a conference between American company FTI Consulting and two right-wing Colombian groups affiliated with former President Alvaro Uribe in the Colombian city of Cucuta in June of this year. The three groups propose an initiative they name “The Venezuelan Strategic Plan” and list the ways in which they can disrupt all facets of Venezuelan society in the run-up to December’s regional elections. The strategies to be employed include: “creating crisis on the streets, facilitating the intervention of North America and NATO forces with the Colombian army,” power cuts, food shortages, support and financing of the political opposition. 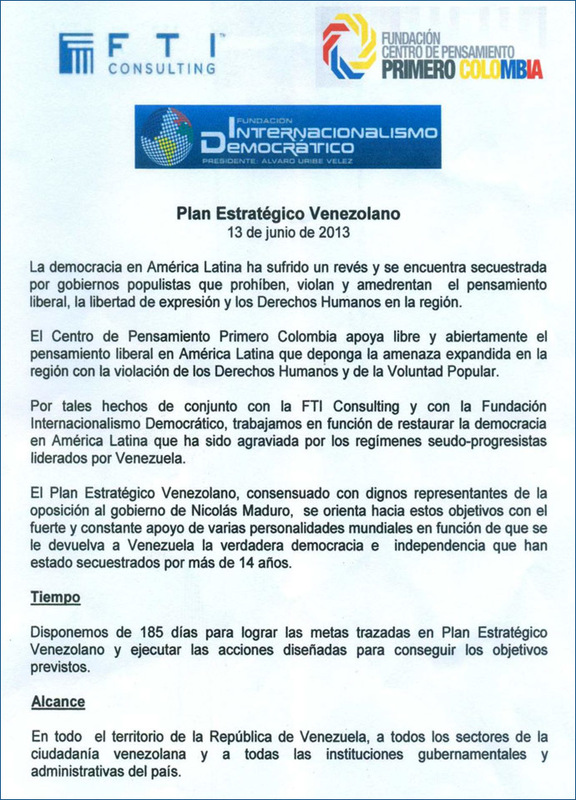 The document writes that violence should also be encouraged and “whenever possible lead to deaths and injuries.” It also gives special mention to Venezuelan opposition figure Henrique Capriles who lost in the presidential elections at the beginning of the year, advising support of his political campaign. Over the last couple of months, Venezuelan state media has reported on shortages of a number of basic products, including sugar, milk, oil, butter and flour. Moreover, there have been a number of reports of large quantities of these basic good being confiscated from warehouses belonging to businessmen linked to the opposition and smugglers crossing the border to Colombia. In August, Venezuelan authorities intercepted between 50 and 60 tons of basic goods in the state of Tachira which borders with Colombia. President Nicolas Maduro has blamed many of these cases on attempts by foreign powers to meddle in Venezuelan affairs with a view to destabilizing the country. In October, Maduro expelled three top American diplomats from Venezuela, alleging they were plotting with the opposition to orchestrate mass power cuts. “We detected a group of US embassy officials dedicated to meeting the far right, and to financing and encouraging acts of sabotage against the electrical system and Venezuela’s economy,” Maduro said in a televised speech. Maduro was named as successor by former President Hugo Chavez who died of cancer on March 5 this year. When Maduro assumed the presidency in April he swore to carry on the legacy of Chavez and adopted the same fiery anti-American rhetoric as his predecessor.